Years ago my Grandmother Sarah prepared a small collection of her favorite recipes from which several cousins created a treasured cookbook for all of our family to enjoy. As I opened her cookbook recently, right there on page five was her recipe for fatayer or meat pastry. Welcome to my home as I share my version of this delicious pastry with you. 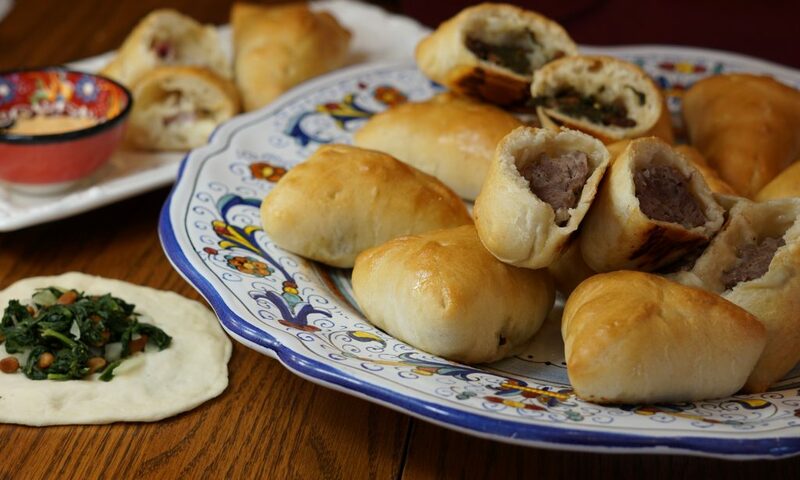 Meat pastries are found in many world cuisines and were common in my childhood home. There seems to be a particular protocol in making them within families and cultures. In our home and that of my Mother’s family, bread dough was filled with a seasoned, raw beef or lamb and onion mixture and formed into a triangle shape with the dough edges pinched closed. They were about the size of your hand, prepared in large quantities and baked to a beautiful golden brown. The flavor from the meat baking into the bread made them especially delicious. Mix in a bowl, cover, and place in the fridge while preparing the dough. Mix and let stand until the yeast starts to bloom. Mix thoroughly and knead for 10 minutes. Set aside to rise until doubled. Once doubled, punch down. Use the remaining ¼ cup to dust a surface for rolling, place the dough on the floured surface and dust the top of the dough to prevent sticking. Use a rolling pin to roll the dough out until it’s about ¼ inch thick. Cut rounds of dough with a 4” round biscuit or cookie cutter. Enlarge each round of dough slightly by pressing it out with your fingertips or lifting and stretching the dough. Try to leave a pillow of dough in the center while pressing out the edges. Place at least a heaping tablespoon of the meat mixture in the center of the dough round. To form a triangle pastry, lift three sides of the dough up over the meat to the center and pinch it closed at the seams forming a little triangle shaped pastry. Repeat with the remaining dough. Place the pastries on a baking sheet lined with parchment paper and bake in preheated 350˚ oven for 18-20 minutes. Once you remove the pastries from the oven, you may spritz or dab the top of each with a small amount of olive oil. Rough chop 4 cups of baby spinach. Fill your pastries, seal, and bake. Venturing completely away from the original flavors and into another country, I also made Rueben pastries with deli corned beef, Swiss cheese, and sauerkraut. I squeezed the juice from the sauerkraut before filling the dough and served with Thousand Island dressing. Do you have a favorite food that reminds you of home? Share and comment! We would love to hear from you! Enjoy! As a cooking enthusiast and advocate of healthy living, join me in creating delicious, nutritious recipes that energize and fortifies you.